Multicultural Sounds travels the world for contemporary reinventions of cultural staples. Spain’s Grammy-winning Ojos De Brujo tackle every genre under the sun in their remix album, and Montreal/Los Angeles by-way-of Iran’s Niyaz talk humanitarian ideas on their latest, Sumud. Barcelona’s Ojos De Brujo (aka Eyes Of A Warlock/Sorceror in English), certainly know how to release a multicultural slaw of dub, electronica, tropical, ragga, everything, and more of everything. Antagonistic male rapping cuts into female vocals singing Spanish with a Middle Eastern warble and flair; dubstep takes over with stereotypical wobbles at times, only to fall into ragga beats; tropical rhythms and flamenco influences creep in until all things are indistinguishable and challenging. This is global dance music at some of its best, and it’s a pleasing surprise Ojos De Brujo are a Grammy-winning act. 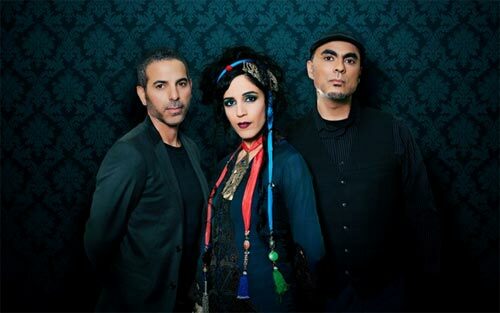 Niyaz (نياز), meaning “yearning” in Persian and Urdu, is an Iranian musical trio now based in Montreal and Los Angeles. Middle Eastern roots proliferate here, not only in ecstasy on the instrumental front, but on the thematic front as well. The trio’s lyrical inspiration for their third album, Sumud, was affected by touring conflict-strewn areas in the Midle East. More on this band to come, but first, enjoy the music video from their album single, “Parishaan”, directed by Johnny Ranger. The MP3 can be downloaded on their Bandcamp HERE.